Thank you very much for the award.. I want you to help me to save the world, I can’t do it on my own. I’m the only person who has a strategy. I’ve done so many graphics as an activist that I decided to make them in to a set of playing cards. I’m going to talk about one of the playing cards: Rot$ otherwise known as free-market capitalism. We’re fighting a battle and Rot$ is our enemy. 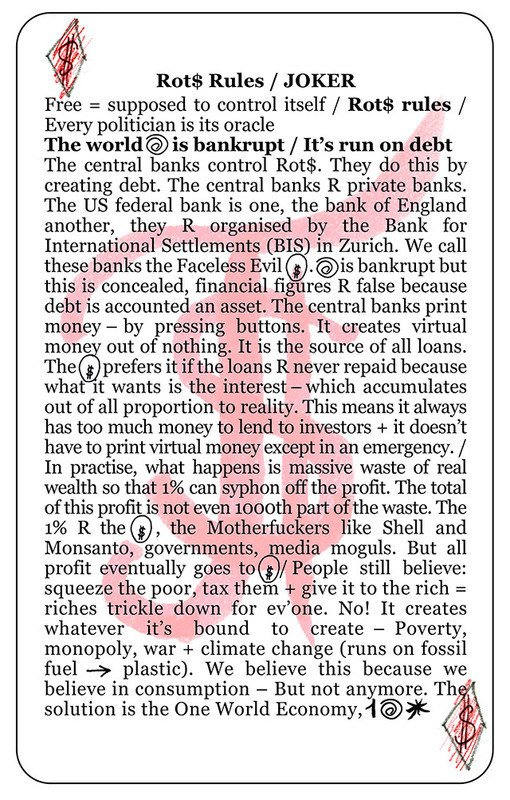 It’s the cause of all our problems – climate change, war (it’s a war economy) and it’s the cause of the financial crisis – it’s programmed to fail. The world is bankrupt, and it runs on debt. This is what politicians believe: if you squeeze the poor and tax them and give it to the 1% of the richest people in the world that it’s going to be good for everybody. Of course it’s not! This is such a stupidity, all the financial pundits and the press also believe it, and so this is our enemy. Look at Macron, in order to help the environment, he wanted to put a tax on fuel – but it can’t work. You can’t put a tax on something that particularly hits the poor at the same time as giving tax breaks to the 1% even though his intention of trying to save the environment is really good. Democracy can’t work because this system is imposing an unfair distribution of wealth, this is why we have all our political problems. Look at Bolsonaro, if he cuts down the rainforest it’s suicide of the human race. The only way we can get democracy to work is to change the financial system. That’s the solution and the answer is in the pack of playing cards. One of the cards is SWITCH to green energy supplier which we have been working together on with the BFC. I’m going to give my message in a public way, I want you to follow me. Follow me, Rot$ Rules, Know Yr Enemy. 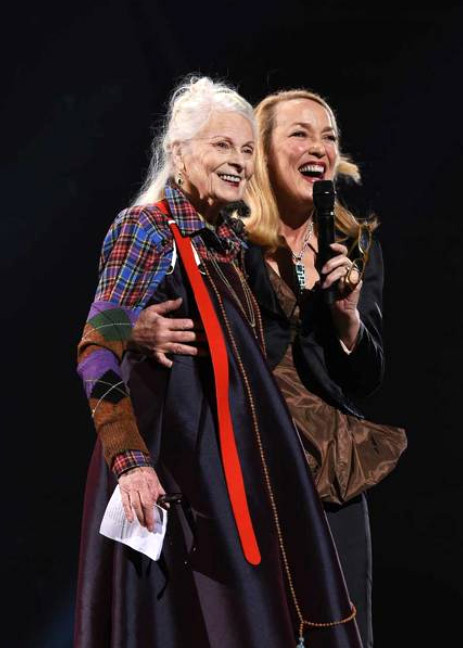 I love what you do and what you say Mrs Vivienne Westwood! I still believe that, alongside some action out there, changing one’s energy and cleaning one’s inner garbage / obstructions does change the world. Which is something I’ve been committed to do on my self and help others doing if they need my support. A last note: I write about art in a generalist French magazine published in London. My articles are in fact a semiotic analysis of an artwork on display in London, they are well informed but simple enough to be read and understood by anyone. I happened to be writing on the portrait of you Vivienne by Martin Parr soon to be shown at the National Portrait Gallery. That’s how I bumped onto this website, as I was researching for this article. I have added the website address to make our readers aware of your “climate revolution”.